OK, the title is a bit of an exaggeration, but I just spent over two hours without an Internet connection and some idiot rear-ended my car, so please bear with me. Before going any further, I want to point out that I am a loyal Mobinil customer; I use their LinkdotNet DSL service (they recently acquired this company), subscribe to Mobinil Star, and use their 3G data plan on my iPhone. Overall, I am satisfied with their services, and this incident is not going to change that (much), but I do feel that they can put more effort into training their customer service representatives. This all started when I found myself waiting for over two hours in my car on a family errand. After exhausting the battery of my iPhone browsing the Internet using my data plan, I decided to see if I could get a WiFi signal on my iPad. Luckily, I was able to detect a Mobinil WiFi hot-spot nearby. I have used this service before, so I have a password associated with my cell phone number. I thought that getting connected would be a breeze, all I had to do was enter my cell phone number and password and I would be good to go. Turns out that I was in for an unpleasant surprise. For those of you unfamiliar with the service, the iPad screen-shot below shows the page that I got when I tried to access the service. After entering my phone number and password in the page above, I got a cryptic “Server Error” message. Thinking that I had forgotten my correct password, I tried calling #107# from my cell phone to get another password, this resulted in the even more cryptic message “Unknown Error”. At this point, I decided to see if their customer service could shed some light on these cryptic messages, so I called them. Since I was in my car, I decided to call their 110 hot-line from my cell phone. Below is a transcript of this call. Customer service rep: Hello, how can I help you? Me: I would like to connect to a Mobinil WiFi hot-spot, but I get a “Server Error” message when I enter my cell phone number and password on my iPad, and “Unknown Error” when I dial #107# from my phone. What should I do to correct this? 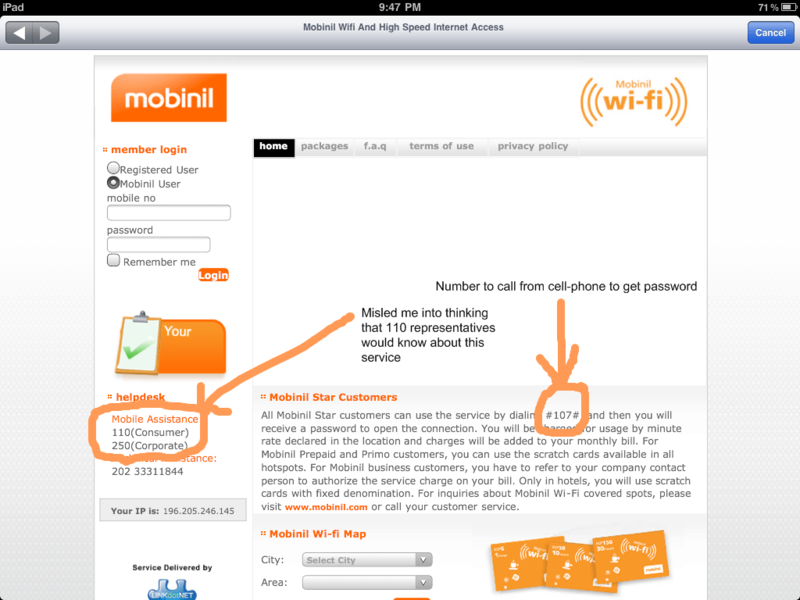 Customer service rep: Is your iPad from Mobinil? Me: No, I bought it from Tradeline Stores, an Apple reseller, but its not a 3G model, and my problem is WiFi related, so that should not be an issue. Customer service rep: What type of iPad do you have? Me: It’s a WiFi only model, but why is this relevant? I want to connect to the hot-spot, my device type should be irrelevant. Customer service rep: I need to know the type of iPad you have, is it from Apple? Me: Huh? All iPads are from Apple, do you want to know the storage capacity of my device? Like I said, its a WiFi only model, the 16GB model to be exact. But how is this relevant to my problem? Customer service rep: I need to know if the problem is caused by the WiFi or your iPad. Me: It’s definitely a WiFi problem, my iPad works fine. Customer service rep: What type of WiFi do you have? Me: What? I am sorry, but I have no idea what you are talking about. Apart from the a/b/g/n varieties of WiFi, I don’t know what you mean by “type of WiFi”, and I don’t think this is relevant to my problem — the iPad can connect to any of these. Is this what you mean? Customer service rep: No, I mean what type of WiFi do you have? Is it Huawei or another model? Me: Ah, you are asking about the type of router I have. OK, let me clarify something. I am inquiring about Mobinil’s WiFi hot-spot service. I am not at home. I do not own the router providing the service, it belongs to some cafe. All I want is to connect to your network, I should be able to do that since I have an account with Mobinil (I am using the password I used to access this service before), if my account is invalid, calling #107# should get me a password, I don’t know why the type of router is relevant. Customer service rep: I need to know the type of router to solve the problem. Me: So, you want me to go ask the administration of the cafe what type of router they have? Me: OK, let me do that and call you back. Of course, I was not going to go into the cafe and ask their administration about the type of router they had. The customer rep had no idea what he was talking about. I had no problem connecting to the access point, the problem occurred when trying to authenticate using my cell phone number and password. Calling #107# to get a password also didn’t work. This had nothing to do with the type of router being used in the cafe, unless the customer rep somehow thought that when I dialed #107# from my phone, the call got routed to the cafe’s router! I waited a couple of minutes and then called 110 again. I hoped that this time I would get connected to someone who knew what they were talking about. Alas, this was not to be. Here is a transcript of my second call. Customer service rep: OK, hold on until I get more information from the department responsible for this. Me: Sure, I will hold on. At this point I thought that I had finally solved the problem; here was a customer service rep who at least knew that he was not equipped to answer the question being posed, and was trying to get more information from someone who knew more about this. Turns out I was being overly optimistic. After a 5 minute hold, the customer service rep came back to me with this extremely “useful” reply. Customer service rep: Thank you for holding. You need to ask the people in the cafe for a password, then enter the password they give you. Me: I am sorry, but aren’t Mobinil hot-spots administered by Mobinil? I have already registered for this service and have a password associated with my cell phone. Also, your website tells me to call #107# to get a password, surely the cafe has nothing to do with this. Customer service rep: No sir, the password is different in each cafe, Mobinil does not administer this. Me: OK, let me do that. At this point I had lost all faith in Mobinil customer service representatives. They obviously had no idea what they were talking about. Mobinil hot-spots are administered by Mobinil through LinkdotNet. The bill for this service is added to the telephone bill for Star customers, I have used the service on one previous occasion. The fact that you can get a password by calling #107# should have been enough to convince these people that their network managed the service. I was about to give up on the whole thing when I noticed that they had a landline, 0233311844, for technical support. Since I was on my cell phone, I, naturally, went with calling 110 first. But since that had been a total fiasco, I decided to give their landline a try. As soon as I got through to a representative and explained my problem, he told me that currently that part of their service was down — I could still log in using a username and password (not my phone number), but I would need to buy a prepaid card to access the Internet, the part of their system that allowed postpaid customers to log in with their phone numbers and have the cost of the service added to their phone bills was down. At last I got through to someone who knew what he was talking about!! The answer did not get me on the net, but at least it gave me closure. The bright side of this entire thing is that it helped me while away the time — by the time I got through to the customer rep who knew what he was talking about, the family members I was waiting for had finished their errand. So, while I am generally satisfied with Mobinil services, I really think they should educate their customer service reps about their own products. I lost a lot of faith in the company today. I will now, at best, take the advice of their customer service representatives with a grain of salt. Now!! Your personal hotspot working?? I have prOblem alsO like you.. Before thats i use etisalat package , working normally.. But now i change to mobinil.. So said.. My personal hotspot is gone.. And i cant use my personal hotspot now.. There is a new “Personal Hotspot” service on the iPhone, I have been using that for a while and it works great.